This Monday former FC Barcelona president Josep Lluís Núñez (1931-2018) passed away at the age of 87. 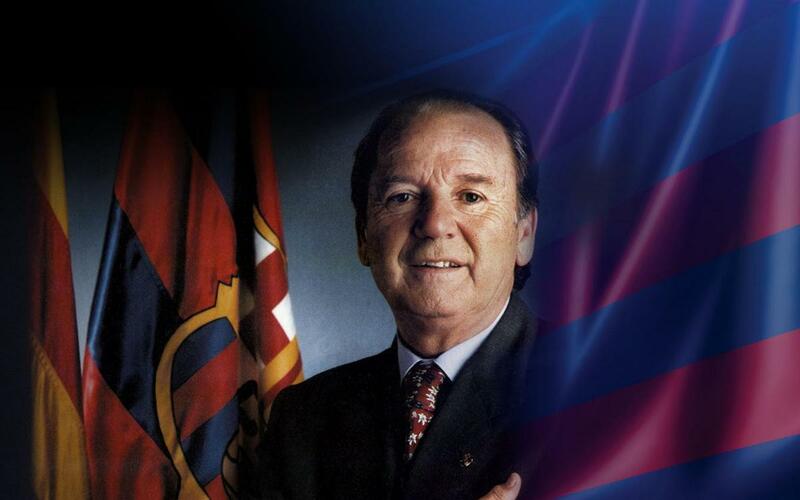 FC Barcelona would like to express its sadness at the passing of the man who president of the Club between 1978 and 2000 and who has left us today Monday at the age of 87. FC Barcelona pass on their condolences to the family at this difficult time as well as those of the members, supporters’ club members and fans of the Club as well as those of the world of football. May he rest in peace. Josep Lluís Núñez i Clemente was the longest serving president in club history, a remarkable 22 years, from 1978 to 2000. This was a decisive period in the club’s history, with huge changes to the way football operated around the world, particularly in terms of finance and media attention. Born in 1931 in the Basque town of Barakaldo, he moved to Barcelona at a young age. He made his earliest impact on the club in the first democratic presidential elections after the end of the Franco dictatorship, in May 1978. Although he was a famously successful businessman, he was unknown to the world of sport, but his campaign slogan of “Per un Barça triomfant” (For a triumphant Barça) managed to gather enough support among the members to win by a narrow margin, gaining 10,352 votes to edge out the 9,537 for Ferran Ariño and the 6,202 for Nicolau Casaus, two candidates that were much better known for their associations to the club. The Dream team era continued through to 1996, and was a strong period for Nuñez, despite the major setback of losing the European Cup in Athens in 1994 to the other great team of the early nineties, AC Milan. Barça’s extraordinarily high hopes were dashed by a 4-0 defeat, marking the end of an era. Johan Cruyff was shown the door in 1996, a decision that Nuñéz described as a difficult one, for the successes of 1988-1996 had been all about the tandem between the president forging a solid institution and the coach guiding the team into its greatest period ever. The opposition were a minority, but they were persistent, even filing an unsuccessful vote of no confidence in 1998. It was precisely in November 1998 that the president set in motion plans for the extraordinary celebrations of centenary of the club, which showcased all the good that had been achieved in his time in charge. Reflecting his focus on promoting other sports, that centenary year saw all the professional teams win their respective leagues. But these were long and difficult times, and after Barça lost the Champions League semi-finals he resigned in May 2000, emphasising how he had left the club on solid footing, with a financially valuable squad, strong assets and the support of the penyes.